The only best way to cook pork spareribs is to precook the ribs in the oven and finish them on the grill. But you can also finish the ribs in the oven. Uncover them and continue to cook for 30 minutes (for crisper ribs, take the ribs out of the sauce for the final baking). Most of us prefer pork back ribs, which are meatier and less fatty than side ribs, but side ribs are very flavourful. Both have their devotees. Use homemade or storebought barbecue sauce for this recipe. Preheat oven to 300°F. Prepare a baking dish. 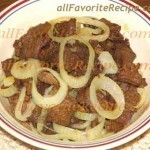 In a pot, combine garlic, onions, mustard, beer, barbecue sauce, sugar, hot pepper sauce and salt. Bring to a boil over medium-high heat and then reduce heat and simmer for about 10 minutes. Place ribs in a baking dish and pour sauce over top. Cover dish tightly with foil and bake ribs for 1-1/2 to 2 hours, or until fork-tender. Remove ribs from baking dish. Skim fat from sauce and bring to a boil on medium heat and cook for about 3 to 5 minutes, or until thickened. Brush sauce over ribs. Preheat grill on medium heat. Grill ribs for about 20 minutes, basting and turning twice. Ribs should be glazed with sauce. Serve with reserved sauce on the side.